Armenian manuscript of 1053. Work of Johannes in Iceland. 10th century Eyrarland statue of Thor, the Norse god of thunder, found in Iceland. Iceland was Christianized in the AD 1000, when Christianity became the religion by law. In Icelandic, this event is known as the kristnitaka (literally, "the taking of Christianity"). 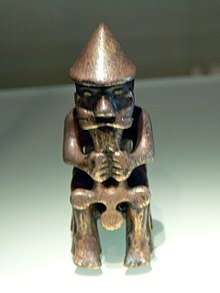 The vast majority of the initial settlers of Iceland during the settlement of Iceland in the 9th and 10th centuries AD were pagan, worshipping the Æsir (the Norse gods). Beginning in 980, Iceland was visited by several Christian missionaries who had little success; but when Olaf Tryggvason (who had converted around 998) ascended to the Norwegian throne, there were many more converts, and the two rival religions soon divided the country and threatened civil war. The matter was submitted to arbitration at the Althing, with law speaker Thorgeir Thorkelsson, himself a pagan, pronouncing after a day and a night of contemplation that Iceland would become Christian. Iceland's adoption of Christianity is traditionally ascribed to the year 1000 (although some historians would place it in the year 999). The major sources for the events preceding the adoption of Christianity are Ari Thorgilsson's Book of the Icelanders, the Icelandic family sagas and Church writings about the first bishops and preachers. Ari's account of the events surrounding the conversion seems to be reliable; although he was born 67 years after the conversion, he cites first-hand sources. Beginning in 980, Iceland was visited by several missionaries. The first of these seems to have been an Icelander returning from abroad, one Thorvald Konradsson. Accompanying Thorvald was a German bishop named Fridrek, about whom little is known. Thorvaldur's attempt to convert Icelanders met with limited success. He was the subject of ridicule and was eventually forced to flee the country after a conflict in which two men were killed by Thorvald. When Olaf Tryggvason ascended the throne of Norway, the effort to Christianize Iceland intensified. King Olaf sent an Icelander named Stefnir Thorgilsson back to his homeland to convert his fellow countrymen. Stefnir violently destroyed sanctuaries and images of the heathen gods – this made him so unpopular that he was eventually declared an outlaw. After Stefnir's failure, Olaf sent a priest named Thangbrand. Thangbrand was an experienced missionary, having proselytized in Norway and the Faroe Islands. His mission in Iceland from c. 997–999 was only partly successful. He managed to convert several prominent Icelandic chieftains, but killed two or three men in the process. Thangbrand returned to Norway in 999 and reported his failure to King Olaf, who immediately adopted a more aggressive stance towards the Icelanders. He refused Icelandic seafarers access to Norwegian ports and took as hostages several Icelanders then dwelling in Norway. This cut off all trade between Iceland and its main trading partner. Some of the hostages taken by King Olaf were the sons of prominent Icelandic chieftains, whom he threatened to kill unless the Icelanders accepted Christianity. In the 11th century, three Armenian bishops, Petros, Abraham and Stephannos are recorded by Icelandic sources as Christian missionaries in Iceland. Their presence has been explained in terms of the service of King Harald Hardrada of Norway (c.1047–1066) as a Varangian in Constantinople, where he had met Armenians serving in the Byzantine Imperial Army. The Icelandic Commonwealth's limited foreign policy consisted almost entirely of maintaining good relations with Norway. The Christians in Iceland used the King's pressure to step up efforts at conversion. The two rival religions soon divided the country and threatened civil war. This state of affairs reached a high point the next summer during the meeting of the Althing (Alþingi), the Commonwealth's governing assembly. Fighting between adherents of the rival religions seemed likely until mediators intervened and the matter was submitted to arbitration. The law speaker of the Althing, Thorgeir Thorkelsson, the gothi of Ljósavatn, was acceptable to both sides as mediator, being known as a moderate and reasonable man. Thorgeir accepted responsibility for deciding whether Iceland should become Christian, with the condition that both parties abide by his decision. When this was agreed, he spent a day and a night resting under a fur blanket, contemplating. The following day he announced that Iceland was to become Christian, with the condition that old laws concerning the exposure of infants and the eating of horseflesh would remain, and that private pagan worship be permitted. These sticking points related to long-established customs that ran contrary to the laws of the Church. Horsemeat is a taboo food in many cultures, and Pope Gregory III had banned the Germanic custom of its consumption in 732. Likewise, infanticide used to be widespread around the world, and the practice of exposing "surplus" children was an established part of old Icelandic culture. It was strongly believed that there was a limit to the number of people the island could support and that rearing too many children would bring disaster for all (see carrying capacity). Thorgeir, who was himself a pagan priest, took his pagan idols and threw them into a large waterfall, which is now known as Waterfall of the Gods (Icelandic: Goðafoss). The problem of changing religions was thus solved, as people abided by Thorgeir's decision and were baptized. Civil war was averted via arbitration. Iceland's peaceful adoption is in many ways remarkable, given the decades of civil strife before Norway became fully Christian. A likely explanation is that the major gothi chieftains of Iceland preferred religious change to civil strife. Once the Church was firmly in control in Iceland, horsemeat, infanticide, and pagan rituals practiced in private were banned. ^ It was Ari fróði who used the exact phrase "two or three men" (Íslendingabók ch. 7). The murders are also described in Kristni saga, Njáls saga, Landnámabók, and several other sources. Thangbrand's victims included the skalds Thorvaldr veili and Vetrlidi Sumarlidason, and probably also Vetrlidi's son. ^ A.E. Redgate, The Armenians, Blackwell Publishers, 1998, 2000, pp. 233–234. ^ Gwyn Jones, The North Atlantic Saga: Being the Norse Voyages of Discovery and Settlement to Iceland, Greenland, and North America, Oxford University Press, 1986, pp. 149–51.